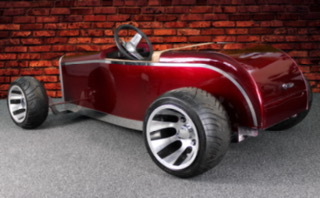 We are a manufacturer of miniature working ride on model vehicles, our initial model being a 1950’s style hot rod based on a 1932 Ford Roadster. 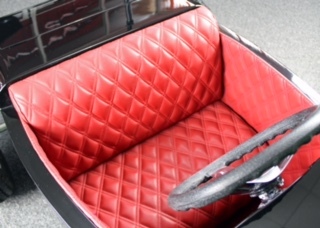 We plan on adding more classic and vintage vehicles to our range in the future. All images supplied by the Hudsons Model Car Company. Our vehicles can be used as models, artistic centre pieces, focal points, marketing tools, filming and TV advertising as well as ride on miniature working vehicles. All our vehicle are lovingly hand built by Mike, our master craftsman from the aviation industry. He has over 27 years experience in aviation engineering with a degree in aeronautical engineering. Mike’s wife Melissa heads up marketing and social media and has a 12 year career in child care reaching managerial level and Thomas and Annabel (aged 4 and 5) are our test pilots for setting up and test driving our newly built vehicles. 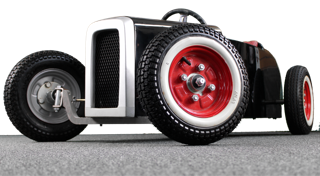 Our vehicles are hand made from aircraft grade T5 aluminium. They are built in the same way as aircraft, a riveted framed monocoque design with aluminium skin forming a very strong structure. This gives a perfect surface for a glass like finish. They are powered by Honda’s Gx120/160 side shaft engine, already proven in the go-karting world. Being an all aluminium vehicle, it is light, very robust, will not rust and will stand the test of time making it perfect to be handed down through family generations. The interiors are custom made by our chosen trimmer who came from the super yacht industry, as is our sprayer. We are inspired by customer led design. There are many different options available and combined with customers requirements and ideas we can produce a truly bespoke one off vehicle for our customer. We use the finest and most reliable materials to make this luxury item unique. 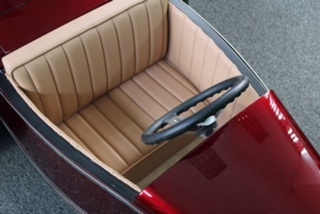 Our options include full British Highland or softer Italian leather interiors, carpeted floors, machined alloy wheels, custom paint finishes in any colour required, graphics or stripes. We have also have the means to hydrodip (a new form of very thin wrap sealed in gloss lacquer). 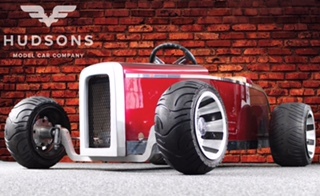 Body options include – roadster, pick-up, chisel nose (steeper bonnet for an aggressive look), bottom chop making vehicle appear lower, aero look bare metal (clear powder coated) with domed rivets, tiger shark teeth and airforce roundel. Sizes available – junior (4-8 year old) and senior (9-adult). 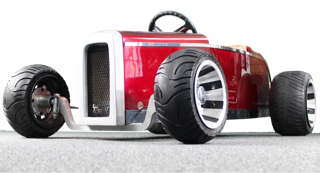 We are currently developing our electric and pedal powered versions and will be out very soon.